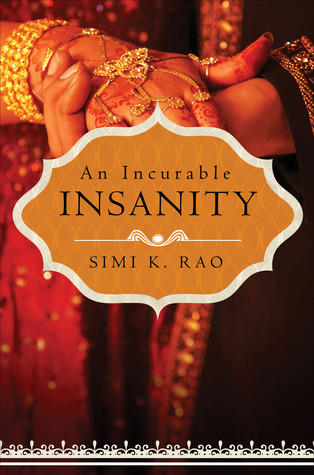 Thanks to TLC Book Tours, we're pleased to present a review for An Incurable Insanity, a new contemporary fiction novel by Simi K. Rao. Make sure to check out the rest of the tour stops to see other reviews! An Incurable Insanity is an interesting look into a culture and way of life that many of us probably find to be very foreign and unfamiliar. Outside of anecdotal things I know from having friends and coworkers of Indian heritage, I don't know all that much about Indian culture, so I really liked the fact that the entire book was focused on that. Shaan is more Americanized, having gone to school in the US, but to Ruhi, everything about the US is new and different, and having to navigate being in a new country, being homesick, and being in a relationship which may or may not work has got to be a big deal for her. Ruhi and Shaan are very complex people. They start out on total opposite sides: Shaan is agreeing to be married only because of obligation, but has no intention of ever really making a life with Ruhi. Ruhi, however, was attracted to Shaan as soon as she saw him, and was heartbroken to find out that he wasn't really interested in her. Over the course of the story, they swing back and forth with their feelings for one another and their intentions, and it takes a very long time for them to get on the same page. I did enjoy how strong-willed Ruhi was, and how she managed to blend her headstrong personality with her culture and religion's values. While I felt that she came across as fairly naive at times, I liked how determined she was to get her way (even if I didn't always agree with how she did things or with what her end game was). At the start of the story, it's hard to like Shaan, since you know off the bat that his relationship with Ruhi is a sham. But over the course of the book, he becomes easier to like as he realizes the mistakes he's made and tries to fix things with Ruhi before it's too late. When I was reading the book, I felt like I had to put my cultural expectations as a white, middle class American woman aside, and try to see things through Ruhi's eyes. The expectations around Ruhi's behavior and obligations are definitely not something that was in my culture or upbringing, so while there were times where I was like, Ruhi, girl, why are you putting up with this crap, I had to remind myself that her world is very different than mine. Once I did that, I was able to enjoy the story more -- otherwise, I just found myself getting angry about things because they didn't fit my worldview (like people expecting Ruhi to have Shaan's permission before going anywhere, for example). The characters and situations are all very melodramatic and I really wanted people to just use their words with one another and to stop jumping to conclusions. Most of the problems in this book could have been solved if Ruhi and Shaan talked something out without getting angry or making assumptions. But then, we'd have no book, so it works. At times, I did feel that the writing was a bit stilted and could have been smoothed out in the editing process, but overall it was a quick, easy read. Sounds interesting? Check out our giveaway below! If you've got an address in the US, you can win a paper copy of the book. If you're outside of the US, you can win an ebook copy.